The new HHT30 digital stroboscope employs exclusive microprocessor technology to provide reliable and accurate speed measurements and stop motion diagnostic inspection. 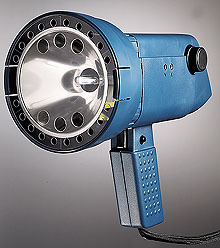 The unit includes a rotary encoder to enable quick and precise frequency setting from 30 to 14,000 flashes per minute. The crystal controlled circuitry eliminates drift and provides accurate readings to 0.1 RPM. “Divide by 2” and “Multiply by 2” buttons allow a quick check of actual RPM. “Phase +” and “Phase -” buttons allow internal phase delays to be added or subtracted to keep the reference viewing target in eyesight of user. An “adder mode” enables visual inspection for misalignment or bent odd-numbered fan blades, propellers, etc. The “Tach” mode permits the unit to be used with external sensors to measure up to 200,000 RPM directly without flashing the Strobe. Up to 6 user preset memory values can be recalled for quick routine checking of equipment, and the unit recalls the last value measured. A “% Charge” battery indicator shows remaining charge status. A low battery cut out (microprocessor controlled charging circuit) provides long battery life. Electronic switching circuitry provides continuous operation and bright light output. 참고: All units come complete with operator’s manual and NIST certificate. HHT32 also includes rechargeable battery and ac charger. “-KIT” models also include rugged carrying case and spare lamp.